The Federal Motor Carrier Safety Administration (FMCSA) granted an application submitted by the National Tank Truck Carriers, Inc. (NTTC) and the Massachusetts Motor Transport Association, Inc. (MMTA) on behalf of the transportation of specific petroleum-based fuel in interstate commerce. The two associations asked for an exemption from the 30-minute rest break requirement in the federal hours-of-service (HOS) regulations. According to federal regulations, interstate drivers — who are required to maintain a record of duty status, or log, on board the commercial motor vehicle (CMV) — are subject to the 30-minute rest break provision. However, those drivers who meet the criteria to claim the “100 air-mile radius exception” do not have to maintain a log and are not subject to the 30-minute rest break requirement. The tank trucks are normally loaded with products in the morning, and deliver the products to three or more service stations during the remainder of the duty day. Most of the estimated 38,000 vehicles engaged in such transportation each day qualify for the 100 air-mile radius exception. However, on rare occasions, they unexpectedly exceed the criteria to complete the day within 12 hours, and are required to log the day. NTTC and MMTA outlined the concerns they have with interrupting delivery of hazardous materials in order for the driver to take the required 30-minute rest break. For instance, as a security measure, a motor carrier may require that a tank truck transporting certain fuels be attended by the driver when the vehicle is stopped, and a driver attending a CMV is not considered off duty as required by the rest-break rule. Attendance is not required by regulation except for transporters of certain explosives. FMCSA granted this exemption because it found that the level of safety achieved by this industry operating under the terms and conditions of the exemption, would be equal to, or greater than, the level of safety that would be achieved if the drivers were required to take the rest break. These drivers receive several short “breaks” each day when they unload product at service stations. While the exemption will allow these drivers to operate beyond the 12th hour, they will still have to complete their duty day before the 14-hour limit by which most CMV drivers are governed. In addition, these drivers will be required to maintain an HOS log in accordance with Part 395, as required of all CMV drivers who find during a duty day that they are not qualified for the 100 air-mile radius exception. The exemption is effective April 9, 2018, and expires on April 10, 2023. J. J. Keller & Associates, Inc.® All rights reserved. Reprinted with permission. The American Transportation Research Institute (ATRI) Board of Directors has approved the 2018 Top Research Priorities as identified by ATRI's Research Advisory Committee (RAC). ATRI's RAC developed the list of recommended research topics at its meeting held in Dallas in March and the ATRI Board vetted and approved that list at its meeting last week. The research topics cover a wide array of critical industry issues including the impact that urban planning and "smart city" design have on truck operations, inconsistencies in CDL testing, and continuing research on the impact of autonomous technologies on the trucking industry. Urban Planning and Smart City Design for Trucks - examining how and where truck freight delivery can be effectively incorporated into urban planning and smart city design approaches. Assessing the Consistency and Accuracy of CMV Crash Data - will identify ways to improve commercial motor vehicle crash data collection, quality review, data management and data submission at the local and state levels. Role and Impact of Government Regulations on Autonomous Vehicles - research will assess the positive and negative impact of regulations being promulgated at the state-level for identification of model legislation on how autonomous technologies and vehicles should be deployed. Inconsistencies in CDL Testing - will review the range of requirements for CDL testing across states and identify best practices to develop an effective set of testing requirements. Autonomous Impacts on the Truck Driver - a detailed analysis of how autonomous truck technologies will change the operational environment and driving requirements for commercial drivers. Best Practices for Cannabis Intoxication Testing - exploring best practices in the U.S. and abroad, the research will benchmark recommended maximum intoxication levels and identify recommendations for driver sobriety testing. ATRI is the trucking industry's 501(c)(3) not-for-profit research organization. It is engaged in critical research relating to freight transportation's essential role in maintaining a safe, secure and efficient transportation system. This is in response to your recent letter to Governor Murphy suggesting that port drayage trucks 2006 and older be banned from Port Newark and Elizabeth. We as a group represent the port community including the drayage trucking industry, owner-operators, terminal operators, labor and shippers - all of whom depend on the success of the ports in Newark and Elizabeth. Over the past several years, there has been a substantial amount of misinformation regarding port drayage trucks and their emissions in the port region. Facts matter. n Port drayage trucks make up less than 4% of all trucks and 1% of all vehicles on the regional roadways. n In 2017 there were 12,845 trucks registered with the PANYNJ serving the ports. Of those trucks, 46% (5,908) were already "clean trucks" (2007 engine model or newer). n Since March 2016, only trucks with engine model years 2007 or newer can register to work in the ports. n In 2018, the 1994 & 1995 engine models were banned from serving the Port of NY & NJ, further reducing the number of older trucks, increasing the percentage of clean trucks to 47%. The number of older trucks will continue to shrink due to natural attrition, drivers retiring, relocating, and voluntary utilization of truck replacement programs. n If the 6,642 pre-2007 trucks currently serving the port were banned next week, it would result in a port-wide shut-down. Those truckers could easily work on the domestic freight side and keep their trucks, which are legally registered to operate in the United States and fully compliant with EPA standards. n The driver shortage throughout the industry is real. It is already difficult to find truck drivers. Eliminating a significant percentage of drivers from operating at the port would be a disaster. Considering the thousands of cars and non-port trucks that pass through the port region, along with other emission generating factors (power plants, oil boilers, garbage incinerators, refineries, airport, NJ Turnpike), it is difficult to believe that the current older trucks serving the port are having the such an impact that they should be banned while other emission generators can reduce their emissions via voluntary programs. We all want to have clean air. The question is … is it fair to make a handful of port drayage truck owners lose their businesses and income when they represent a mere fraction of the actual emissions that exist? No other entity is being asked to make such a sacrifice, and being made to suffer so disproportionately. Your proposal to ban all 2006 and older trucks from the port would do irreparable harm, not only to the port drayage truck owners, but to the viability of Port Newark and Elizabeth. We are all committed to working with you and other interested parties to find sensible, voluntary solutions to continue to mitigate emissions in and around the port. New York Shipping Association, Inc.
(Trenton) - New Jersey Department of Transportation (NJDOT) officials today are strongly encouraging allmotorists to stay off the roads given the severity of the upcoming storm. The safest place to be is at home. Trucks that are already in New Jersey are encouraged to pull off in truck stops to wait out the storm – DO NOT PARK ON SHOULDERS. NJDOT’s first priority is ensuring public safety. The storm is expected to intensify overnight and during the morning, making it challenging for plow crews to keep pace with the storm. The Department is fully activated with more than 2,750 plows and salt spreaders ready to clear state highways. NJDOT is coordinating with all state transportation agencies to ensure the most effective response to the impending weather. NJDOT and other plow crews are the first, first responders. In the case of emergencies, emergency teams cannot respond unless the roads are passable. Residents and motorists should avoid driving unless you are an essential employee needed for emergency response. If you do not have to be on the roads during the storm, stay home. Safety of motorists and work crews is the Department’s top priority. If you must drive, do so carefully and plan your trips accordingly, road conditions can change in an instant. NJDOT will provide appropriate winter driving alerts through Variable Message Signs, www.511nj.org and Twitter - @NJDOT_Info. Restrictions on certain trucks, trailers and other vehicles start at 8 p.m.
all recreational vehicles, or RVs. The above-listed vehicles will be prohibited from traveling on the PA Turnpike’s east-west mainline from Ohio to New Jersey (I-76, 70/76 and 276) and on the entire Northeastern Extension (I-476) beginning at 8 p.m. Restrictions will remain in place through the storm. never pass a truck that is actively plowing or spreading salt. In case of an accident, breakdown or other emergency, PA Turnpike motorists should dial *11 on a mobile phone. Be prepared to give the milepost location and direction of travel and move vehicles out of active travel lanes if possible. While the PA Turnpike discourages travel during winter storms, motorists can check PA Turnpike conditions before heading out at www.paturnpike.com; look at the “Current Alerts” ticker at the top for restrictions. Travelers can also call the toll-free TRIP line at 866-976-TRIP (8747) for the latest travel information. The PA Turnpike reminds motorists to pack a winter emergency kit. A basic kit includes non-perishable food, water, blanket, small shovel and warm clothes. When preparing an emergency kit, motorists should consider passenger necessities like baby food, pet supplies or medications. Follow the PA Turnpike on Twitter at: @PATurnpikeAlert. Interstate 78 from the junction with Interstate 81 in Lebanon County to the New Jersey line. I-80 from the junction with Interstate 81 to the New Jersey line. I-81 from the Maryland line to the New York State line. I-84 from the junction with Interstate 81 to the New York State line. I-380 from the junction with Interstate 80 to the junction with Interstate 81. Additionally, at 8:00 AM on Wednesday, all commercial vehicles will be banned on I-380 and I-84 within Pennsylvania. Restrictions will remain in place as long as warranted through the storm. As conditions develop, speed restrictions and wider truck and vehicle bans will be considered on these routes. PA Turnpike is anticipating enacting the ban on empty straight trucks, large combination vehicles (tandem trailers and double trailers), tractors hauling empty trailers, trailers pulled by passenger vehicles, motorcycles and recreational vehicles, or RVs, on portions of the N.E. Extension from Allentown to the end of the N.E. Extension at midnight. This may expand based on weather conditions. 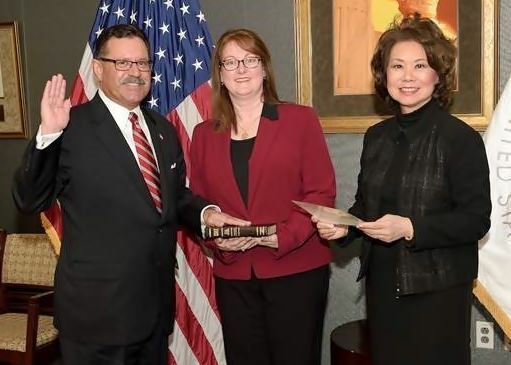 U.S. Transportation Secretary Elaine L. Chao swore in Raymond P. Martinez as the sixth Administrator for the Federal Motor Carrier Safety Administration (FMCSA). “Ray’s years of experience promoting traffic safety at the state level, as well as his knowledge of the commercial motor vehicle industry, will help FMCSA fulfill its critical mission of improving truck and bus safety,” said Secretary Chao. 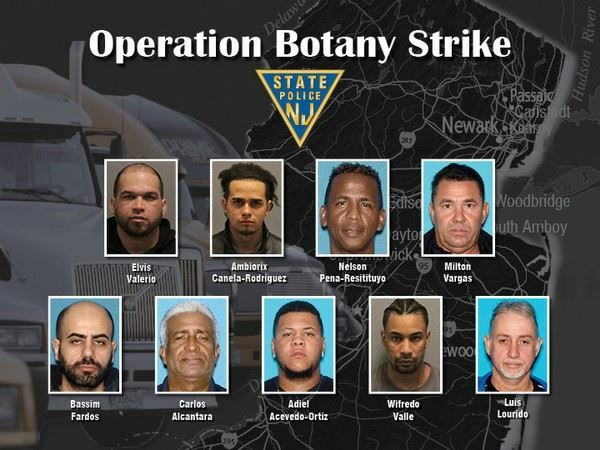 Martinez most recently served eight years as the New Jersey Motor Vehicle Commission’s Chairman and Chief Administrator where he oversaw the agency’s 2,500 employees and a $330 million annual operating budget with more than $1 billion in annual revenue. Martinez advised the governor and state legislature on all areas of motor vehicle transportation and traffic safety and was responsible for developing the agency’s regulatory and legislative agenda and all project prioritization. “It's an honor and privilege to serve my fellow Americans in this capacity and, under Secretary Chao's leadership, I look forward to working with all commercial vehicle stakeholders to effectively reduce the number of truck and bus crashes on our nation’s roads,” said Martinez. Martinez is a former Commissioner of the New York State Department of Motor Vehicles, and also served at the U.S. Department of State. Sign up for updates and alerts regarding agricultural operations information here. If you have additional questions, email us at agricultural@dot.gov.